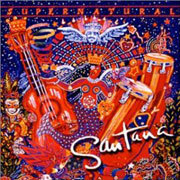 On 1999's runaway hit album Supernatural, Carlos Santana embraced collaborations with a number of artists, both young and old. Though it may have seemed like a groundbreaking idea, Santana has teamed up with fellow artists throughout his career, including other guitarists (John McLaughlin, Jeff Beck, Stevie Ray Vaughan, et al), drummer/vocalist Buddy Miles, saxophonist Wayne Shorter, and many others. In addition, Carlos has always celebrated the brotherhood of man, embracing not only ethnic and cultural diversity, but a wide range of musical styles as well. It is in this spirit that he joined forces with two of the founding members of African band Toure Kunda to produce the joyous "Africa Bamba." Actually, Africa Bamba is a remake of Toure Kunda's song "Guerilla," originally released on the band's 1990 album, Salam. And, in fact, the lyrics of the song are basically an homage to different world cultures, referencing many South American countries, as well as Africa, Japan, and China. Maintaining a relaxed yet sprightly groove throughout, Africa Bamba incorporates African and Latin rhythms beautifully, and makes good use of timbales, congas, and other percussion instruments. The chord progression offeres several twists on the traditional Latin i - iv - V progression. Based in Am, the main chord sequence is Am - E7 - Dm - E7, but a couple of other progressions are thrown in as well, including one that includes an A major! Santana's playing is tasty from start to finish. He switches back and forth between nylon acoustic guitar (with which he opens the song) and electric -- his Paul Reed Smith guitar tone set for medium distortion, to enhance the dynamics of his licks. Carlos also makes a rare appearance on lead vocals; he is backed up by his regular lead singer, Tony Lindsday, and others, for the choral parts. Listen, do you have that happy feeling? Hey, Puerto Rico where are you? Listen, where are you, Peruvians?